Is your smart home safe? Let SENSE take over! Trojans, Malicious spyware, Botnets are just some of the potential threats to your home network. Many people are unaware that these threats can infiltrate your home network by a simple click on a website that like a cyber landmine could have a catastrophic effect on your digital self. Credit card details, access to your personal documents, photographs anything that you have online that is of value can be taken remotely in seconds. This is truly frightening and the attitude this will never happen to me will not protect you. Prevention is better than the cure! Thankfully F-Secure a Finnish cyber security and privacy company established since 1988 have been working on SENSE a device designed to create a secure home network and protect you and your family’s digital identities. SENSE is a smart security router that is being heavily advertised as ‘The missing piece of your connected home’ Being a family man I want to protect my home and family from any threats so what can SENSE do? SENSE can connect to all devices in the home from tablets and smartphones to games consoles and baby monitors. In the age of IoT it is important that all items within your home are under your control and not left open for an unknown presence to use at their will. Listening to F-Secure’s Mikko Hypponen at this years TNW 2017 conference in Amsterdam, made me stand up and take notice that the possibility for a hacker to infiltrate my home through a games console is a reality. With the WannaCry ransomware attack happening in May 2017 F-secures timing to launch SENSE could not have happened at a better time. Everyone needs to be more security savvy and with SENSE F-secure has made this easy to do. You can check out the unboxing of SENSE here with Gareth. Out of the box, you have to appreciate the commendable design of the SENSE router, a strikingly bright white triangular shape with the router panel hidden away at the back, definitely different from past routers I have had which have been typically black/grey and boring. Inside the box, there is a rather striking cardboard panel welcoming you as a smart person for purchasing SENSE. I guess in the world of smart technologies we also need to adapt and become smarter people. Under this you have a few leaflets; Product safety information and a Quick guide setup for SENSE. Below the leaflets, you have the angelic white SENSE router, the power cord and plug and an ethernet cable. The instructions on the cardboard panel instruct you to download the SENSE app from either the Google Play Store or App store. There are a number of ways to connect SENSE to your home network. They are clearly outlined in the instructions. Setup took about ten minutes which was surprisingly quick. I downloaded the SENSE app from the play store and followed the on screen setup. Below you can follow the screenshots of the setup. My current broadband provider is with Sky. SENSE connected effortlessly to the internet and boom it was ready to serve and protect. SENSE creates a secure WiFi network within your home network. It splits the frequency between 2.4ghz and 5ghz which is useful. Your original WiFi network will still be available to connect to but there will be two further options to consider F-SECURE SENSE 2.4 and 5ghz. I’m not sure what I was expecting with this newfound technology. SENSE requires minimal effort and works tirelessly to protect all my devices connected to it. SENSE so far has blocked 386 threats on the 8 devices I have connected to the network. As you can see from the screenshot these threats are generally websites blocked that SENSE realises there is a potential threat. We all have clicked on a ‘where are they now?’ link to be faced with a barrage of advertising and pop ups. Even though you could just look ‘them’ up on a search engine you still proceed to click here for the next page allowing your vital information being collected by a website like this. SENSE recognises the potential threat and blocks the website from being viewed. Unless you don’t mind having your data shared by a website like this SENSE will allow you to continue against its better judgement. My wife and kids are also becoming smarter with SENSE. They are now learning where to access the information they need safely as SENSE has blocked a few of their usual news feed websites are deemed unsafe. The SENSE app also gives a breakdown of each device on browsing protection and tracking protection. The beauty about SENSE is that it will evolve with time, more updates and patches will be created all included with your one off fee of £169. One thing I found surprising is that my phone which I leave on all night was trying to access websites as I slept. This may be an application that has not closed down properly but with SENSE to the rescue it has discovered something sinister and blocked the action. Should you invest in SENSE? The price tag of £169 for SENSE with 12 months membership followed by £8.50 a month subscription may put a lot of consumers off, why pay for internet security when you can get it for free? As you will know nothing is free nowadays and that free software is making you pay for it with your privacy. SENSE does not track your internet history as explained here. With SENSE now running in my house for three weeks, I have discovered WiFi signal to be stronger. Previous to SENSE we had suffered drop offs and had to restart the router in order to connect to the internet again. SENSE boosting WiFi signal is an added bonus to the job it was designed for. SENSE has proven a welcome addition to my now smarter home. The digital clock displayed on the front has become more useful than I originally thought. We have absolutely no luck with analogue clocks in our house no clock has the right display, knowing that the SENSE router has the right time my wife and kids just pop into the hall if they need to know the time. I have peace of mind that my family and my IoT devices are not going to be attacked as SENSE acts as my cyber Guardian. 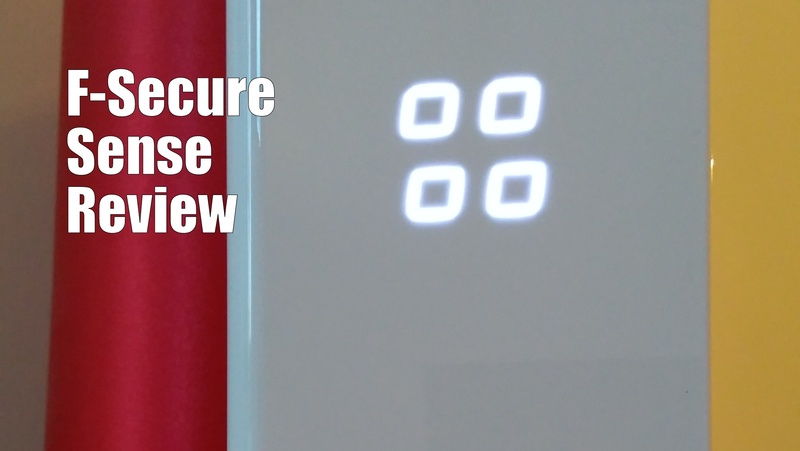 F-Secure has not rushed the production of SENSE as they wanted to get the product just right. Their patience and endurance have truly paid off as SENSE really is the missing piece of your connected home. Extra security functions are available on Windows 7 (SP1) and later (32 and 64 bit) and Android. Power DC: 12V 2A, AC: 110-240V, 50/60Hz 0.8A max.